It’s vibrant and exciting, but still has some of that shabby seaside charm and a little of the old menace chronicled so expertly by Graham Greene in the brilliant Brighton Rock. As a seaside town, it’s hard to beat, and as a place to eat out, even harder. 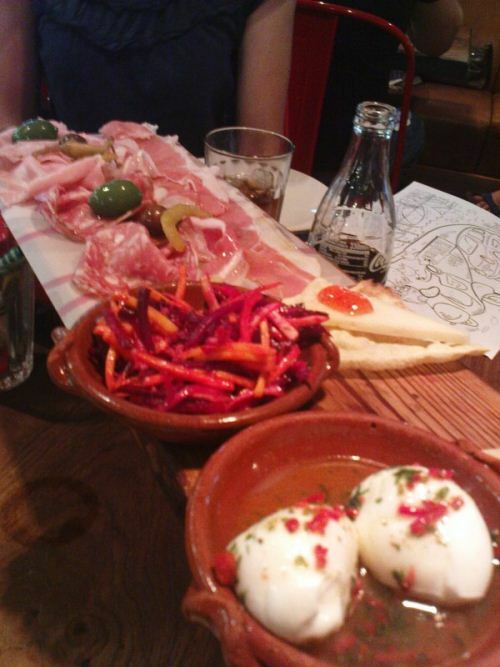 As an end-of-holiday meal out, we had lunch at the Brighton branch of Jamie Oliver’s new Italian chain. It’s a friendly and open restaurant, very suited to families. A counter in the middle of the room heaves with Italian hams and salamis, a huge pizza oven radiates in the corner. 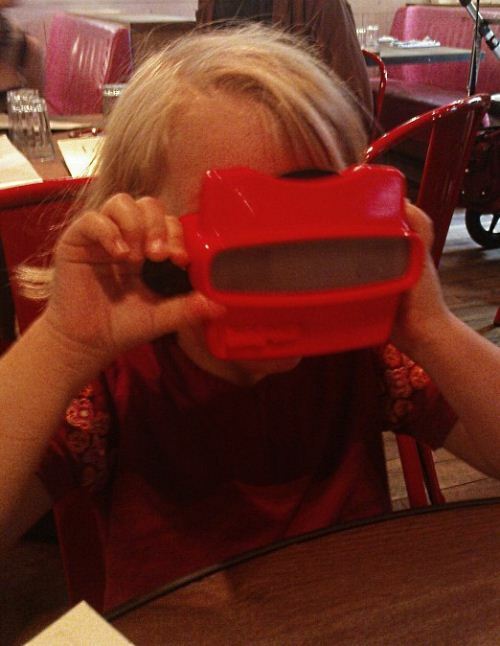 The kids were given their menus, hidden inside one of those magical red slide viewers from the Seventies. This captivated the kids immediately and gave us a bit of peace to look at the main menu properly. Very clever indeed, although I did have some trouble retrieving one of the viewers to have a play, sorry, serious look at the children’s menu myself. I ordered a plank of antipasta to start with. The waiter casually placed a couple of cans of tomatoes down on the table. We looked at each other and half thought that we might end up cooking some sort of pasta sauce ourselves. Later, he returned with a long wooden plank of salamis, pickles, mozzarella and pecorino and rested it on top of the cans, up away from the general clutter of plates and cutlery. Mystery solved. The antipasta was excellent. The hams were just beautiful and the tiny mozzarella balls were by far the best examples I’ve ever had. Superb, simple and very effective food. 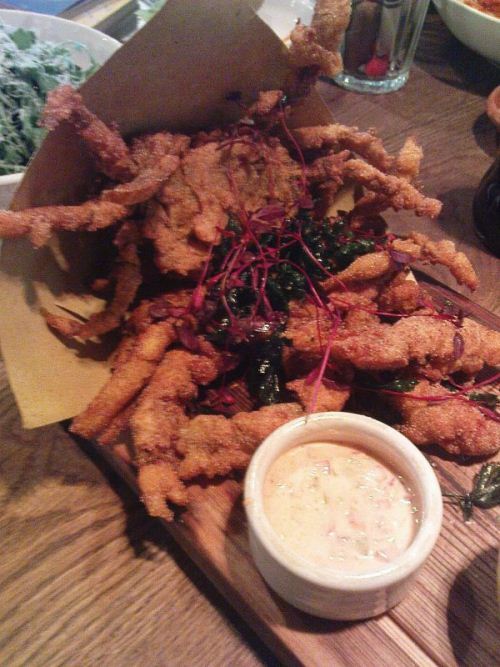 For the main course, I ordered soft shell crabs, deep fried in breadcrumbs with a mayonnaise on the side. I did pause before ordering. Two whole crabs, which parts can’t I eat? The sardines look good. Will it be too fiddly? I decided to risk it and be brave. The crabs were delicious, the soft and tender flesh contrasting perfectly with the crisp breadcrumbs. The meat was rich and tasty, the mayonnaise sharp and cutting. A first class dish. Jen had a carbonara, thick pasta in a creamy sauce with chunks of salty pancetta. The pasta was cooked perfectly, and made me realise that my interpretation of ‘al dente’ may have been a few minutes cooking wide of the mark. It was a huge plate of food, too much for a lunch, really, which Jen struggled to finish. The kids had a pasta dish, spaghetti in a tomato sauce (no green bits, much to Lara’s relief), with some excellent parmesan on the top, and a burger, a good sized patty of chargrilled beef in a toasted sesame bun. Each meal was served with a small undressed salad of a few leaves and some grated carrot, beetroot and butternut squash. The extra carrot was that if they tried the salad – just try it, not finish it – they’d get a badge. In our case, some extra encouragement was needed, too, but both salads were indeed sampled. The children’s menu was packed with easy, unfussy dishes. There were three or four meals that we could have happily ordered. 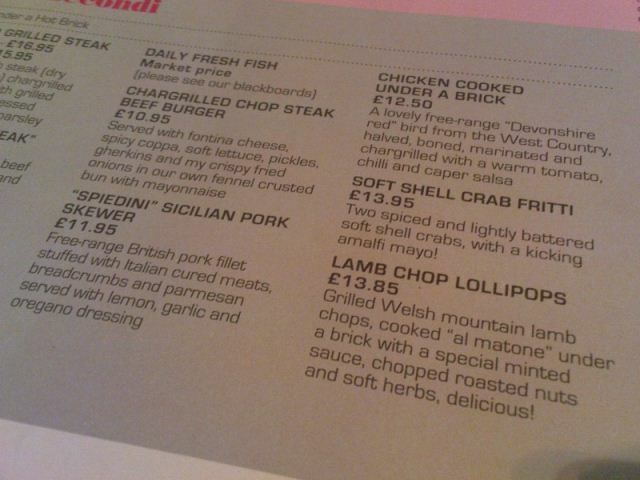 Variety on a children’s menu is quite rare. Dessert for me was an affogato, a ball of vanilla ice cream with a double espresso poured straight over it. Stunning Italian simplicity itself, and a powerful combination. The waiter talked me out of ordering another espresso on the side. Jen had a tiramasu, a generous pile of coffee flavoured trifle with mascarpone cheese. The bill came to about £70, which for a three course lunch for four is great value, although we stuck to soft drinks only. Service was excellent throughout. Our waiter was friendly and attentive but left us alone to deal with the kids when we needed to. First class service. Over dessert, Jen mused that the waiting staff all seemed to be very attractive. She wondered if the only qualifications needed were model looks, but the waiters who dealt with us knew exactly what they were doing, handling a busy dining room with ease, so very clearly not. Jamie Oliver has found a real winning formula here. British Italian restaurants can be a little jaded and familiar, the same dishes cropping up time and time again, some cooked well, others not. 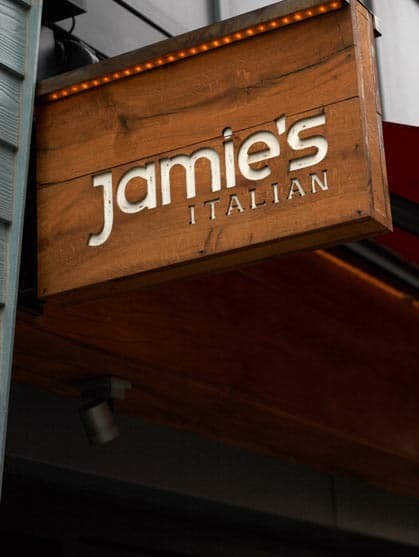 The menu at Jamie’s Italian has some of the staples, but goes beyond them to includes some more rustic and traditional Italian dishes. Jamie’s Italian is a superb restaurant, great value with an interesting menu of simple, honest, well-cooked Italian dishes. At the moment, there are five restaurants in the chain, with another couple coming soon. Jamie, a branch in Leeds would be great, please? Excellent review, and it really sounds like a lot of thought has gone into the whole experience, not just the food. This branch is my "local". I've been there at the weekend, after work, early and late and STILL can't get a table becuse of the queue and don't fancy being crammed into the bar! MAN THOSE CRABS LOOK AWESOME! nice review. indeed nice restaurant. proper italian food, as opposed to greasy "uk italian" cooking. jamie's shop however (also in brighton) is a waste of space. Graphic Foodie – maybe we were just lucky, but we did arrive about five minutes after they opened for lunch. Maybe that's the trick? Leigh – awesome like you wouldn't believe. The crab was seriously good. Art – yes, it is proper Italian food and a very welcome change. Not sure about the shop, as I haven't been there, but a Jamie Oliver branded frying pan (I know, it makes me shudder) has been in regular use in my kitchen for the last 3 yrs or so – it's the best frying pan I've ever had by a mile.